Unframed stretched canvas. Image of grey, black, brown barracks, plume of smoke at left, a mountain peak in the background. 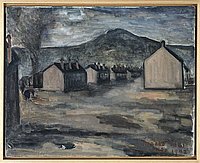 This painting is the second of only two works completed by Hibi in the intial period at Topaz. The living quarters at the Topaz concentration camp were not the renovated horse stalls of the Tanforan assembly center but were, nevertheless, dormitory-style barracks. Families were assigned a room within the buildings which were constructed in rows and separated into blocks. There was little privacy in these small rooms heated only by the pot-belly stoves installed in each cubicle. Any noise could be heard between the thin walls and the severe winds carried the dust through every crevice of the barracks which were sealed only with tar paper. 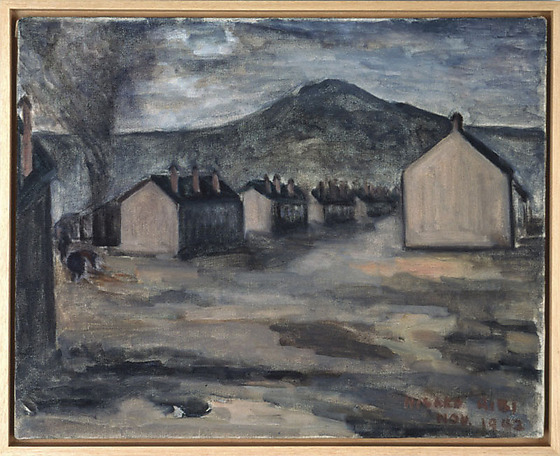 In this painting Hibi depicts the rows of barracks in a stark and somber tone. The mountain peak looms in the background while a tornado-like cloud of smoke or dust rises at the far left edge of the canvas. The paint has been applied with brief brush strokes in a light wash of color for the ground but a more sharply delineated line has been used for the barracks and the shadows that they cast. The horizontal planes of shadow along with the swirling black cloud give an ominous quality to the painting. There is only a hint of blue in the sky in an otherwise barren depiction of Topaz.